Power steering fluid is a crucial element for ensuring that your car’s steering works as expected. It will lubricate the system, maintain balance and facilitate the transmission of pressure to points where it is needed. To maintain a high level of efficiency, you need to check and change your power steering fluid often. Experts recommend a monthly cycle for checking and an annual change schedule. Since different vehicles will have a unique pattern, regular checking will help you be better able to notice a change in smell, color or texture, which will increase your change efficiency. Here’s everything you need to know about power steering oil. Power steering fluid is a necessary element of your engine because it helps control the steering. It also helps to maintain balance by keeping the system balanced and lubricated, as well as transmit pressure all around. The fluid is mineral oil or silicone based and is a hydraulic fluid for specific parts of your gearbox. Some power steering fluids may be made from synthetic oil bases, and are developed for automatic transmission gearboxes. You should be careful to use the right transmission fluid for your power steering system to avoid damaging your steering pump. Power steering increases vehicle steering efficiency by using hydraulic or electric actuators to provide controlled energy to the steering system. The actuator is a hydraulic cylinder that connects your steering wheel to the linkage system that connects your vehicle’s wheels. The system will make it easier to turn your vehicle’s wheels, even during a straights top or slow movement period. Failing to replace your power steering fluid can cause a number of problems, which could include total dysfunction of the transmission system and components. However, vehicles will have varying schedules and proper care must be taken to stay within these maintenance schedules for effective performance. Inefficient transmission systems may cause noise and a difficult steering experience. How do you know when it’s time to replace it? By checking your fluid regularly, you will be able to notice and track the changes in your oil that will necessitate replacement. If your oil has a burnt smell or is much darker in appearance than fresh oil, you might need to change your fluid. You will also be required to replace your oil if it has any debris and particles as these may affect its effectiveness in lubrication, as well as impact pressure redistribution during steering shifts. 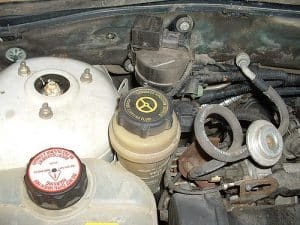 How should you use power steering fluid? Your power steering fluid is generally packaged when ready to use. If there are no leaks in your engine seals, and you have not had any problems with your fluid reservoirs, you can replace your power steering fluid easily. You should be wary of overfilling your transmission fluid because it may cause foaming, and will affect the functioning of your engine. You could avoid filling your reservoir by adding only small amounts of transmission fluid. You will need to check for any signs of degradation and corrosion, ensuring that you flush the system before replacing your power system fluid. You could find a great power steering fluid which offers seal repair to revitalize and protect your engine. However, you will need to check on your engine’s compatibility before flushing or replacing your power steering fluid. Most power steering fluid options will be compatible with their brand’s engines. For instance, Honda transmissions will require Honda power steering fluid. however, thorough research will help you find the right power steering fluid for your engine. Why do you need to replace power steering fluid? Experts recommend a monthly checking and annual replacement schedule for your power steering fluid. 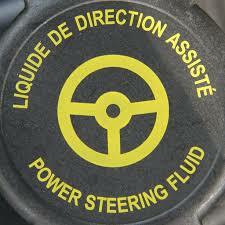 Old power steering fluid could still work in your engine, but will thoroughly affect your ability to control or steer. You will get the best recommendation for your vehicle from the manufacturer’s manual. You can refill or replace your power steering fluid, depending on your observations of your old fluid. You will need to change any fluid with debris, a burnt smell or unusual color. These may also be signs of a problematic transmission unit, and care should be taken to look for any points of corrosion, damage or leakage. If your transmission system is showing healthy signs, you could only be required to top up your fluid. To avoid hindering your transmission, you should only find compatible fluids and refill only similar fluids. You should have it pretty straightforward when changing your power steering fluid, with potential help from detailed vehicle manuals. You need to identify your power steering fluid reservoir, which will hold the fluid. It is usually located near the power pump, although it may be located near the pump hoses. The component is usually made of plastic or metal but is clearly labeled for easier identification. Changing your oil will protect your transmission system from inefficiency, leaks and other factors that may affect your drive. There are two ways to check your power steering fluid levels. If your cylinder is translucent, you may be able to heck oil levels through the medium. You should then compare minimum and maximum levels against your fluid levels. Even if your oil is within the required levels, you will still need to open the cap and check on the fluids profile. You should replace any oil that has debris, a burnt smell or a darker color. For users who cannot see their transmission fluid levels directly through the cylinder, you could use a dipstick to check your fluid. Most vehicles will have a dipstick attached, and this is usually located under the hood. You should insert your dipstick into your transmission unit while checking on your fluid levels against the maximum and minimum markings on the device. Some vehicles may be difficult to get an accurate reading while cold. You could run your engine beforehand, even steering either side and leave the car on idle before checking your oil level. Most vehicles will also provide a dual marking system to help you determine the fluid levels either when the engine is hot or cold. You should be able to tell these apart to avoid getting a false reading.